Take a bowl, add both the flour, ½ cup ghee and knead hard dough with water or milk. Divide the dough into 8-10 equal parts and with your hands prepare long oval fist like dumpling. Take a pan and heat ghee. Deep fry all the dumplings till it turns crispy and golden brown. Drain and keep it aside to cool. In the same ghee deep fry almonds, cashew nuts, pistachio and keep it aside. Deep fry raisins separately otherwise it will burn. Make small pieces and grind it either with mortal and pestle or in the mixture/food processor to get coarse fine powder. Add cardamom powder, nutmeg powder. Take a pan and heat remaining ½ cup ghee. Add jaggery and heat till it mixes, but don't heat it too much. Or you can heat ghee, add jaggery and switch off the gas stove. Stir it till the jaggery melts. You can change the measurement of jaggery as per the sweetness you want. Add jaggery to the coarse powder and mix it well. Add nuts to the mix. Take poppy seeds in a small dish or bowl. 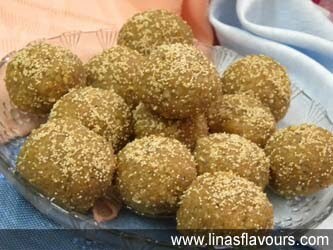 Make small 17-18 balls and roll it in poppy seeds. Press it slightly so that poppy seeds stick to the ladoo. Serve it immediately or store it in an air tight container.